If you’re going for long, curled locks with a subtle half-up clip, then something boho and floral is likely to suit both your hair and your wedding theme. 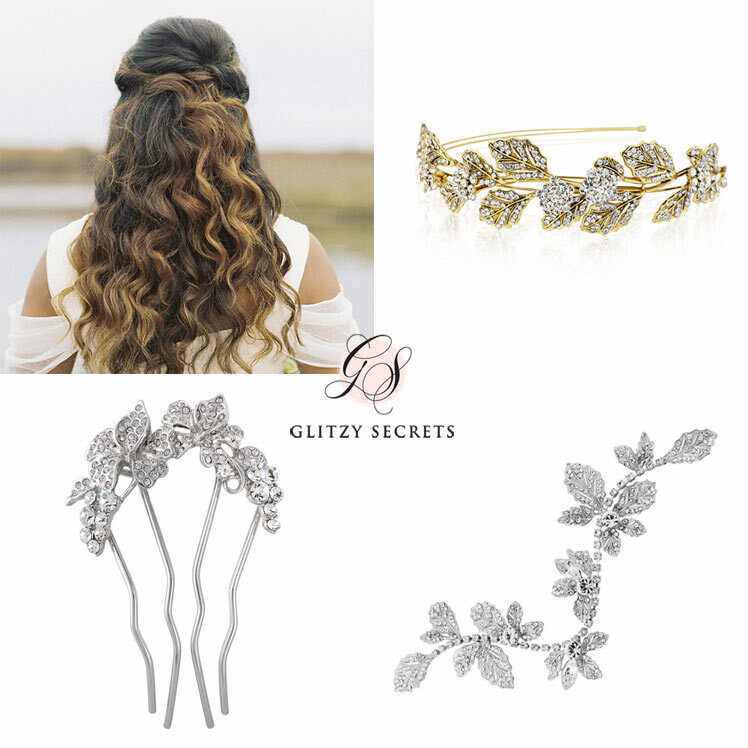 A hair vine like Vine of Elegance Headpiece can easily be pinned into and around the back of your updo to add a little sparkle to your locks (this style also looks great with hair that is pinned completely up, too). 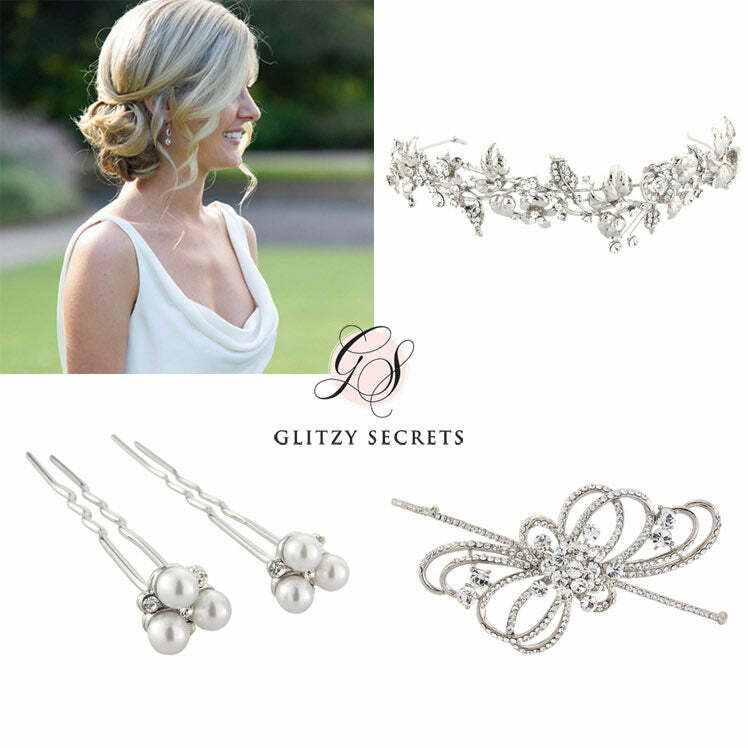 For something a little smaller, our Floral Garland Hair Pin will sit beautifully in the centre of your half-up do, which will not only draw focus away from any plain bobby pins fixed in the hair, but also makes a good anchor for a low veil. If you’d prefer something a little more statement, a gold bridal side tiara such as Gold Leaf is ideal for a boho bride who also loves her glamour! This gorgeous tiara also comes in silver, so it’s guaranteed to match your wedding jewellery. This glam hairstyle first appeared in the 1890s and was popular up into the 1910s, so it’s perfect for a vintage bride – and it’s surprisingly simple to DIY too! 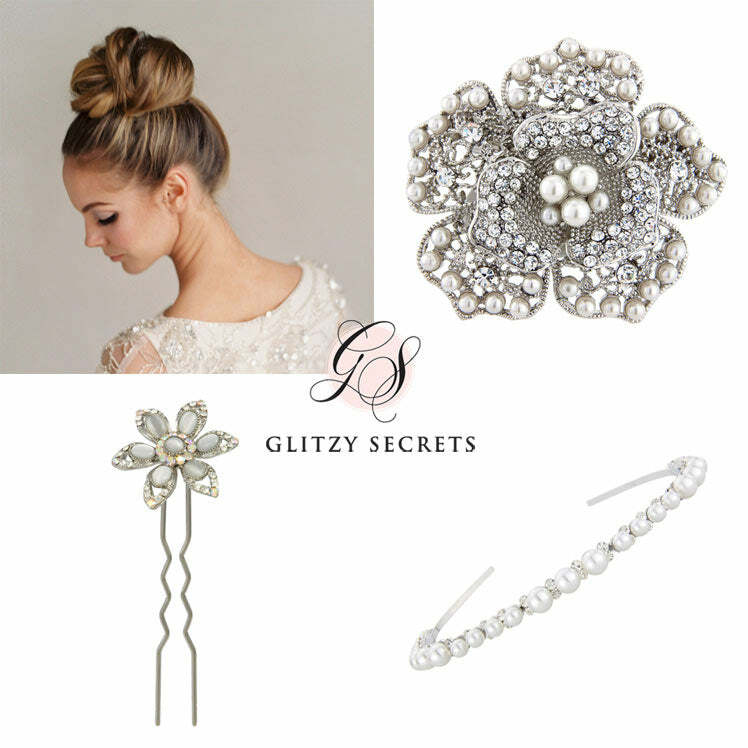 Complement this vintage style with matching Art Deco accessories such as the Grace of Gatsby Hair Pin, which is a gorgeous 1920s design that can easily slip into the updo. For something with a little more ‘wow factor’, try an on-trend headband such as Twenties Charm Hairband which sits on the forehead. If your wedding has more of an English country garden theme, then try something with floral detailing like our incredible Bygone Blossoms Headpiece, which has delicate crystal chains that drape down. The topknot is the cool brides’ hairstyle of choice this year, as it’s a more fashion-forward version of the classic chignon updo. Pins work fabulously with topknots, as they can easily be pressed into the main bun or into the hair wrapped around the base of the style – we recommend our sweet Flower of Love pin for a subtle touch of sparkle. For a bigger floral touch, try the vintage-inspired Bloom of Pearl Hair Clip with its ornate crystal and pearl designs. Topknots also look fantastic when paired with an Alice band or tiara worn low against the high bun – we love our Graceful Beauty headband for this style. A romantic side bun is a classic wedding updo for a reason: it’s flattering to brides of all ages and suits almost every wedding theme. This traditional side pairs perfectly with a side tiara, whether it’s statement or subtle. For a more delicate look, wear the glittering Ribbons of Beauty side tiara with the detailing on the opposite side to your bun – this will give your photographer something to capture no matter which side of you is in shot! If you’d prefer to emphasise your bun with a full bridal tiara, then our Enchanting Garland has a gorgeous and romantic floral design. As with the topknot, pins work beautifully with any bun, so why not true a classic pearl design such as our Simply Pearl Hair Pins? Having a retro 1950s or 1960s-inspired wedding? Chances are you’ll be wearing a beehive! With plenty of volume at the crown, the beehive makes a fab base for most hair accessories – we love how it looks with a sparkling tiara or headband. The Sweet Daisy side tiara is the perfect 1960s-style design for a hippie bride! 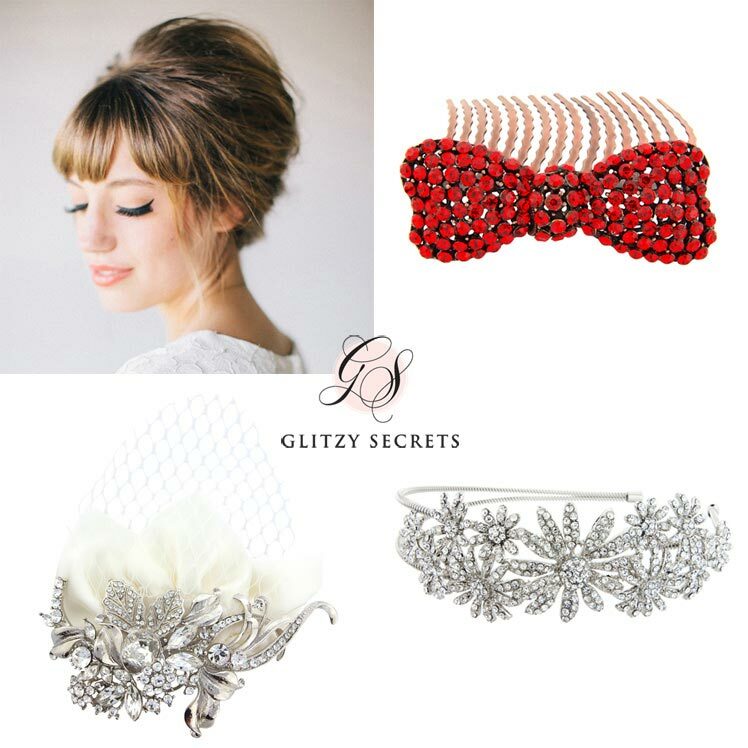 If 1950s is more your style, go for a pop of colour with the Fifties Siren red crystal bow hair comb. You may also be considering a birdcage veil to go with your retro ‘do – if so, our Timeless Petals Headpiece is the perfect blend of sparkling hair comb and veil.